More than forty years after the composer's death, the music of Roberto Gerhard (1896-1970) continues to be recorded and performed and to attract international scholarly interest. 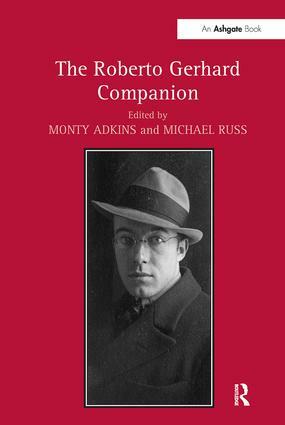 The Roberto Gerhard Companion is the first full length scholarly work on this composer noted for his sharp intellect and original, exploring mind. This book builds on the outcomes of two recent international conferences and includes contributions by scholars from Spain, the USA and UK. The essays collected here explore themes and trends within Gerhard’s work, using individual or groups of works as case studies. Among the themes presented are the way Gerhard’s work was shaped by his Catalan heritage, his education under Pedrell and Schoenberg, and his very individual reaction to the latter’s teaching and methods, notably Gerhard’s very distinctive approach to serialism. The influence of these and other cultural and literary figures is an important underlying theme that ties essays together. Exiled from Catalonia from 1939, Gerhard spent the remainder of his life in Cambridge, England, composing a string of often ground-breaking compositions, notably the symphonies and concertos composed in the 1950s and 1960s. A particular focus in this book is Gerhard's electronic music. He was a pioneer in this genre and the book will contain the first rigorous studies of this music as well as the first accurate catalogue of this electronic output. His ground-breaking output of incidental music for radio and the stage is also given detailed consideration. Contents: Preface; Introduction, Monty Adkins and Michael Russ; Early works and life of Roberto Gerhard, Mark E. Perry; ’Unquestionably decisive’: Roberto Gerhard’s studies with Arnold Schoenberg, Diego Alonso TomÃ¡s; ’Promoting and diffusing Catalonian musical heritage’: Roberto Gerhard and Catalan folk music, Julian White; Roberto Gerhard’s ballets: music, ideology and passion, Leticia SÃ¡nchez de Andrés; Roberto Gerhard, Shakespeare and the Memorial Theatre, Samuel Llano; Music as autobiography: Roberto Gerhard’s Violin Concerto, Michael Russ; Two men in tune: the Gerhard-Camus relationship, Belén Pérez Castillo; Roberto Gerhard’s serial procedures and formal design in String Quartets Nos 1 and 2, Rachel E. Mitchell; Composing with sets: Roberto Gerhard’s Concerto for Piano and String Orchestra, Michael Russ; Roberto Gerhard the serial symphonist, Darren Sproston; In search of a ’third way’, Monty Adkins; The influence of electronic music on Roberto Gerhard’s Symphony No 4 ’New York’, Carlos Duque; Roberto Gerhard’s BBC sound compositions, Gregorio GarciÃ¡ Karman; Select bibliography; Index. Monty Adkins is Professor of Experimental Music at the University of Huddersfield. His writings deal extensively with the aesthetics and perception of experimental electronic music as well as proposing means of analysing this work. He has lectured on Gerhard’s work in New York, Stockholm, Ljubljana and Montreal. Michael Russ is Emeritus Dean and Professor of Music at the University of Huddersfield. He has published on composers including Bartok, Musorgsky and Webern as well as set theory and Schenkerian analysis. As a National Teaching Fellow he has also published on Teaching and Learning in higher education.